A Vermont man was so incensed by his town's zoning regulations that he erected a 700-pound statue giving officials the middle finger — and lit it with floodlights so they would always be reminded of his feelings toward them. Ted Pelkey’s decade-long feud with local officials reached spiteful new heights Nov. 30, when he installed the statue on a high pole in his front yard, near Route 128, after his request to relocate his monofilament cleaning and truck repair business from a nearby town to his own property was denied. Pelkey said officials won’t let him build the garage simply because they don’t like him, and he thought a middle finger was just the right response. “We wanted to show our appreciation,” Pelkey told VICE News. The Westford Selectboard and Development Review Board had denied Pelkey’s requests for the large garage, asserting that his applications did not meet the town’s standards for a variety of reasons. Among them, Pelkey’s application lacked necessary information about lighting that will “likely be needed for security purposes,” and did not effectively describe the purpose of the building, officials said. “He apparently can do what he’s done,” Allison Hope, chair of the Westford Selectboard, told the Burlington Free Press. As it turns out, even though billboards are banned advertisements in Vermont, the middle finger has gotten more attention for Pelkey’s business than any roadside sign ever would have. 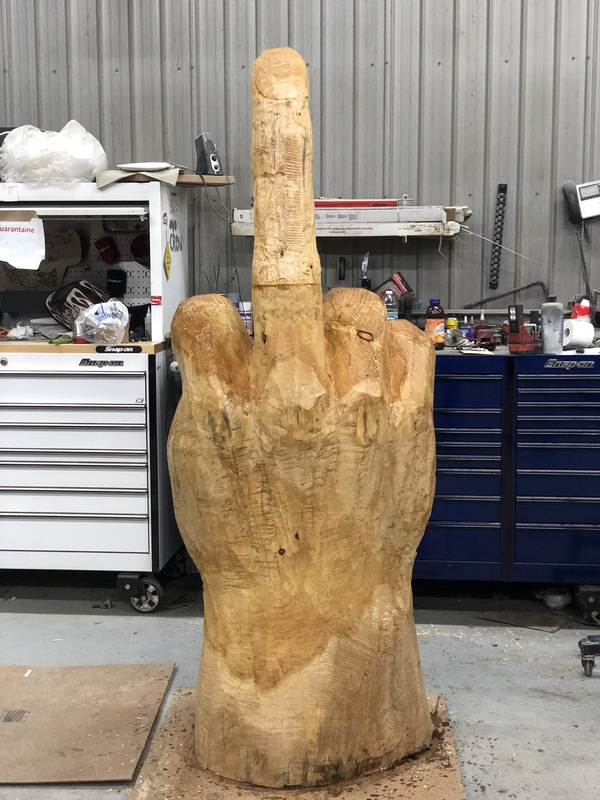 Twitter users have expressed a growing admiration for his pettiness, and there’s even a Facebook fan page for Pelkey’s wooden finger statue. Pelkey’s attorney appealed the board’s decision several weeks ago and is awaiting a decision, according to the Burlington Free Press.